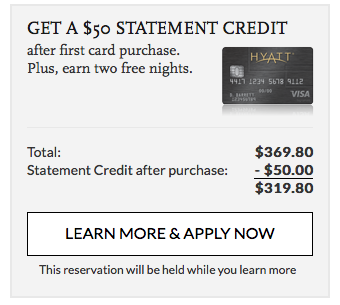 The Chase Hyatt credit card has in my opinion one of the more lucrative sign-up bonuses of any credit card. The standard offer for this card is 2 free nights at any Hyatt hotel in the world. I used my free nights at the Park Hyatt Paris - Vendome where rooms often go for over $1000/night. The new sign up bonus, which requires a few tricks (see below), now not only includes the 2 free nights but also $50 statement credit and 5,000 Hyatt points which can be used for an additional free night at a category 1 Hyatt property. If you play your cards right you can get ~$2000 in value from this sign up offer. Note that this card does come with a 75$ annual fee which is waved the first year. After the first year you get a free night certificate good for any category 1-4 hotel. -For the 5,000 bonus points you need to add an authorized user and have them make a purchase within 3 months. Note: Unlike most, I do not receive a commission from Chase. I simply think this is a great deal.